I had the vague feeling that I read this book before. I remembered bits and pieces, and some settings I recalled quite strongly. The characters were sort of like those familiar faces you run into now and then and know you should place them but they elude you till you stop and ask. I guess the book didn’t make a powerful impression on me the first time, but it wasn’t bad. Not bad at all. After all, it did win the Newbery in 2002. Tree-ear is an orphan in twelfth-century Korea. A peasant, an outcast who digs through rubbish heaps to feed himself and his companion, the crippled old man, Crane-man. Together they live under a bridge in warm weather and in an abandoned cellar pit during the two or three months of cold. It’s rough living, though Tree-ear has an eye for beauty. And beauty isn’t far away in his seaside village of Ch’ulp’o, known for its beautiful celadon pottery. The greatest master among them is crotchety old Min, on whom Tree-ear often spies. He’s captivated by the way the clay takes shape under the potter’s hands. But one day he comes too close and breaks one. So begins a year working under the grouchy master. Min’s wife is kind and generous, supplying Tree-ear with enough food to share with Crane-man and clothing him from her own dead son’s wardrobe. But Min bitterly declares that Tree-ear will never be his son and so shatters the boy’s hopes of learning the potter’s craft. For it is a skill always passed from father to son. Still Tree-ear is pleased to be so near the master, whose fine work just may bring a much-coveted commission from the king. But Min is too old to carry his finest two vases to the city for inspection. Tree-ear volunteers, though the way is far and the path plagued by robbers. Will he reach the city? Will the vases be accepted? Will it change his relationship with Min? Then the vases are smashed. This is an interesting look at ancient Korean culture and a very lovely coming of age story. I sympathized with Tree-ear, and I enjoyed the beautiful settings and all the details of pottery making. The whole novel is as beautifully crafted as one of Min’s vases. 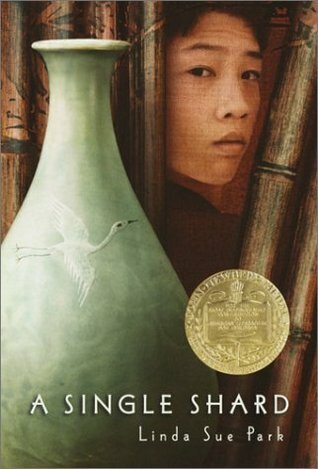 However, the story didn’t resonate as strongly with me as other Newbery winners I’ve read. I guess that’s why I forgot it the first time. Yet giving it a recommendation is a no-brainer. A Single Shard is a good one and squeaky clean. Probably a fifth grade reading level but appropriate for younger readers who show an interest. It’s very well done. It has a very distinct cultural feel to it. I love period pieces and stories from other countries. It almost feels like historical fiction, but you didn’t indicate that. I’m glad to know of this book. Great review. Yup, I think I would call this historical fiction. It doesn’t include much activity on a national scale, but it’s deeply set within a Korean surrounding. An enjoyable read. I’ve tried to read all the recent Newberys, but this is one I haven’t picked up yet. I think, when they win such a prestigious award there is always something valuable to think about and learn from them even if the particular story doesn’t resonate strongly with you. Thanks for bringing this one back to my brain. I love this book, it is one of my favourites. I have given it as a gift to a young boy with a keen interest in pottery. My adult daughter is a potter so I gave one to her as well. I have always loved books set in another time and place. Funny how different books resonate differently with different people. I’m glad you enjoyed this one so much, and it’s cool that you share it. It’s certainly well written. The setting was one of my favorite things about it.